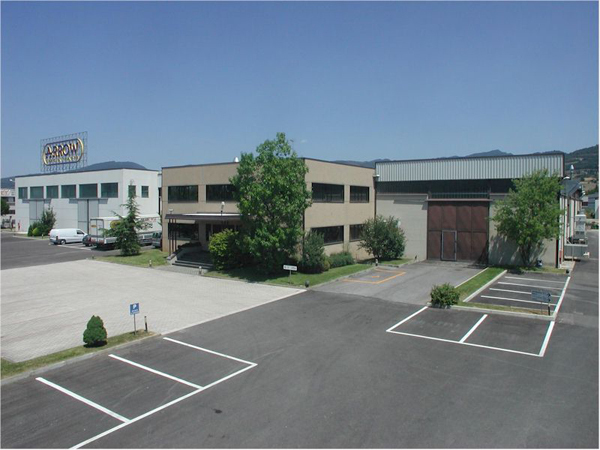 Arrow Special Parts S.p.A was founded in 1985 when Giorgio Giannelli made real his project to create a company whose major task was to be production of highly performing exhaust systems. Since the first days, Arrow started distributing off-road exhaust systems and handlebars developed and made in strict co-operation with the former 125cc World Champion Michele Rinaldi. After a couple of years, the first great success arrived when Belgian rider Jobè won 500cc World Championship. In the meanwhile, to 2-strokes exhaust systems (mufflers and silencers) a new range of products for 4-strokes off-road bikes was added, designed for and developed during Paris-Dakar off-road rallies, a work that led Arrow to 1988 Paris-Dakar win with Orioli's Honda. 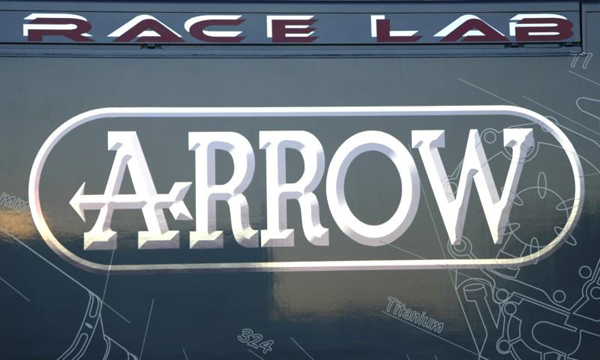 In the 90's Arrow brand got the success it deserved, expanding in Worldwide markets and with an impressive series of successes in races. We must enlist World Titles won by Puzar, Parker, Schmit, Schwantz, Moore, Biaggi, Doohan, Criville, Bartolini and Chambon. A long list of riders among the bravest in the World, contributing both to the brand success and to the greatest increase in performances and quality standards of the products. During the 90's massive investments in Research and Development took place: it was the birth of R&D department and of RaceLab, our “on-wheels” R&D, created to bring Arrow's support directly on tracks. Arrow stated definitely his presence in the exhaust systems market with these steps. Moreover, to the actual products new lines were added, for scooters and street bikes. Stainless steel, carbon fibre and titanium alloy: these are materials Arrow used and is still using to keep its qualit, desing and performances standards, together with strong development and production requirements and handcraftsmen experience. 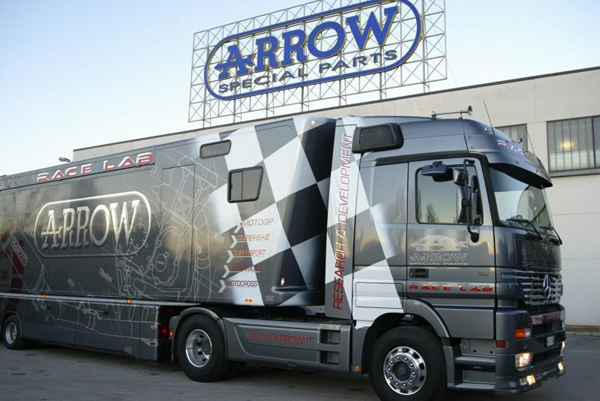 Arrow was a company born to produce racing parts. Since 2000 Arrow won more than 20 World Titles, in SBK, SS, MX, SuperMoto (Everts, Seel, Corser, Charpentier, Toseland and others won with Arrow!). In 2008 we added 3 more Crowns: MX1 World Championship, with David Philippaerts, in S2 World Championship with Adrien Chareyre and SS World Championship with Andrew Pitt. 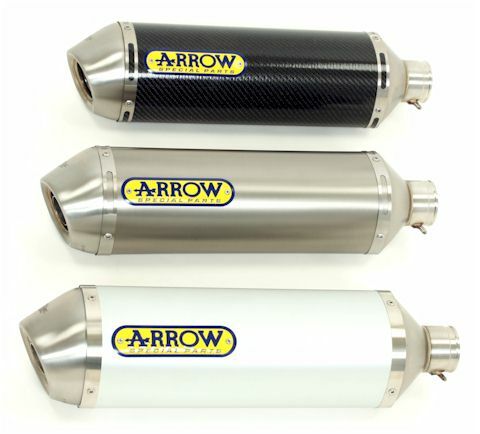 Research in races has always a strong effect on Arrow's products, leading to development of a new line of systems for the most powerful SportBikes and of a new line of exhausts for maxiscooters. 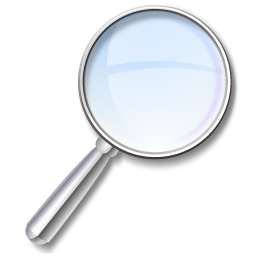 All the products are being developed together with European Certification Companies. In 2007 Arrow got the approval for his Environmental Management System, according to ISO 14001 standards. The plant is being fullfilled with high-tech machinery, able to match quality, effectiveness, efficency of the production process. Also, a new tool-making department waws established. Production is not limited to aftermarket exhausts. Most important motorcycling brands share with us development and production of OE systems and special parts (among these: Aprilia, Husqvarna, MV Agusta, Triumph). An important and challenging activity is to be present in the most important motorcycling worldwide exhibitions: we would like to mention just two of these: EICMA in Italy and Dealer Expo, in Indianapolis, the USA. There we can meet and discuss with our customers, supplier and motorcycling fans. A 20-years-lasting experience witnesses that Arrow is a dynamic-driven company, with a young mind headed towards the things to come in the next future. Just a last comment: we're among the most important companies in this market. 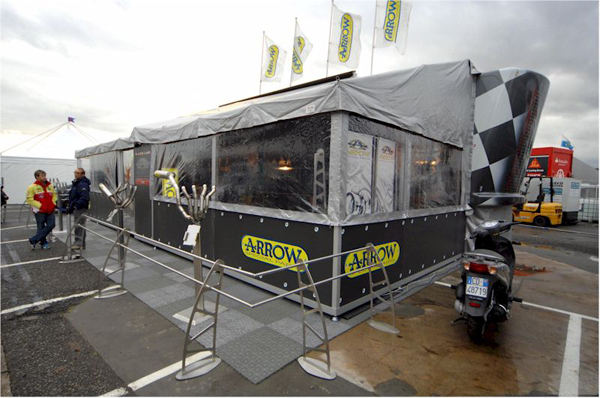 A powerful structure, the projection of Arrow's R&D in European race-tracks. It's a sort of “R&D on wheels”, with its own test bench and a small workshop, making it possible to make the last adjustments on ECU maps and, if needed, some “last-minute” repairs. 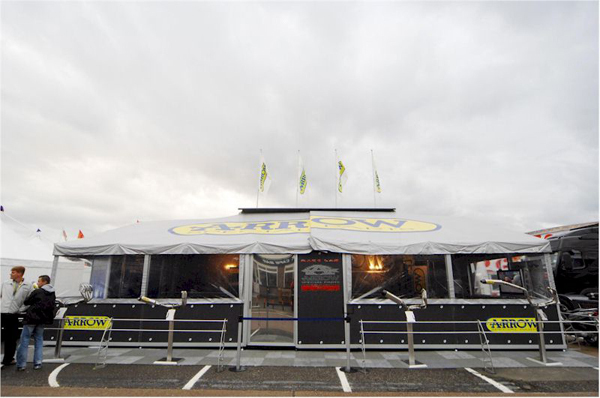 In the years the Race-Lab became an “hot-spot” in the SBK races, for Arrow-supported teams but also for other teams. Furthermore, a private briefing-room and an hospitality give the chance for some relaxing time, for riders and team's people.